Strolling through Central Market the other day, I noticed a common thing in almost every fruit and vegetable stand —the fresh, locally grown vegetables are arriving. Rhubarb, spinach, scallions and spring onions, watercress and other herbs are beginning to appear at most of the farm stands, along with my personal favorite spring vegetable, asparagus. Asparagus’ popularity goes back to the earliest times in recorded history. There is a recipe for asparagus in the oldest surviving recipe book, from the third century, and the vegetable is seen on an Egyptian frieze dating to 3,000 B.C. Asparagus is low in calories and sodium and high in potassium, protein, fiber and vitamins A, C and E. There are studies linking asparagus to important health benefits. It is high in antioxidants and folate, which is critical for pregnant women and in the prevention of heart disease, and has been proven to help reduce the loss of calcium, which is important as people age. So why is asparagus the ugly stepsister in the vegetable garden? Its appearance in the dining room has been known to send kids running and screaming in fits of apoplexy. One of my daughters worked herself into such a frenzy over asparagus on her plate that she sat crying at the dinner table, accusing us of child abuse, treason, sedition, even of a personal vendetta against her. And those were the nicer things she said. If only she would try it — just one taste. I’ve grilled it over hot coals; roasted it with pine nuts and olive oil; steamed it with lemon juice and served it with Hollandaise sauce (what could be better than a sauce made from butter and eggs? ); and stir-fried it with carrots, water chestnuts, sesame seeds and sesame oil. Yet all I get at dinnertime is crocodile tears. But I forge ahead, looking for the recipe that will create the “light bulb” moment when she realizes — and she will, some day — how wonderful asparagus really is. I like asparagus so much that I have endured the years it takes to make an asparagus plant productive. However, since it isn’t quite ready yet at home, I picked up a couple of beautiful bunches from the Stoners at market, and I’m going to be a little adventurous with this wonderful delicacy. I’ve adapted this recipe from one I learned from my chef-mentor. Enjoy. Holding the spears by the ends, gently break the asparagus and discard the stem end. Wash thoroughly and cut into 2-inch pieces. Plunge into boiling water for 3 minutes, then immediately into cold water and ice cubes. Allow them to cool completely, then drain. Heat the peanut oil in a heavy enamel soup pot. Add the scallion and ginger and sauté for 30 seconds. 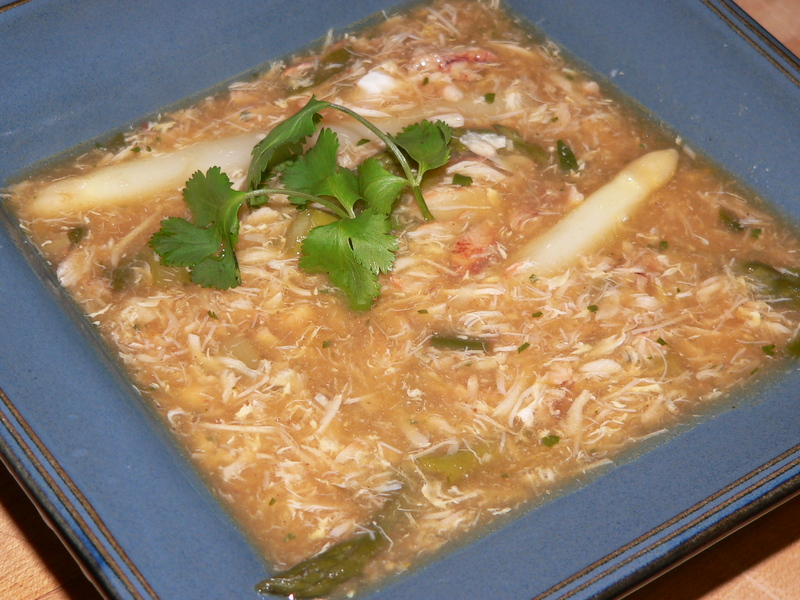 Add the stock, vinegar, chile oil, asparagus, crab, soy sauce, 2 tablespoons cilantro, and pepper and bring to boil. Reduce heat to lowest setting and simmer for 10 minutes. Dissolve cornstarch in cold water, add slowly to the soup, stir until boiling, reduce heat to low-medium, and simmer 3-4 minutes, until soup begins to thicken. Remove from heat. Add toasted sesame oil and stir well. Then gently stir while adding the egg very slowly, to get the beautiful egg threads that only restaurants seem to get right. Garnish with cilantro and asparagus tips, and serve hot.